(Bloomberg) -- India’s benchmark stocks gauge rose for a third day on Monday to close on the verge of a record. The S&P BSE Sensex Index added 0.5 percent to 38,871.87 after briefly topping its previous record set end of August, while the NSE Nifty 50 Index rose 0.4 percent. The rally mirrored a surge in stocks worldwide after strong manufacturing data out of China helped ease investor worries about a slowdown in global growth. 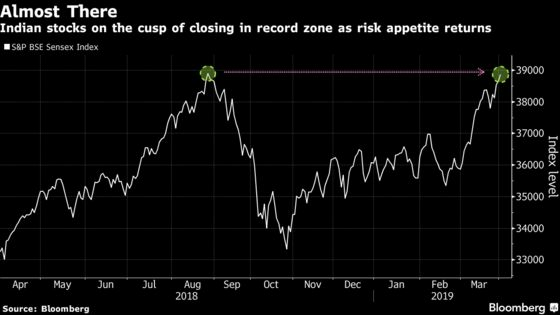 Foreigners have pumped more than $7 billion into India stocks so far this year -- among the highest in Asia -- on optimism that lower borrowing costs and a second term for Modi in the upcoming polls would support earnings growth in Asia’s third-biggest economy. The advance has put India on course to become first among markets valued at more than $1 trillion to hit a record high in 2019. Stocks have largely been driven by foreign flows betting on political stability and a revival in economic growth, said Jagannadham Thunuguntla, senior vice president and head of research for wealth at Centrum Broking Pvt. in Mumbai. NOTE: The central bank will lower its key rate at an April 4 review, according to most economists in a Bloomberg survey. Indian stocks were upgraded to overweight on the outlook for corporate profits, BNP Paribas SA analysts wrote in a note on the weekend. 12 of the 19 sector indexes compiled by BSE Ltd. advanced, led by gauges of metals and software stocks. 17 of the 31 Sensex members and 26 of the 50 Nifty stocks advanced. Tata Motors Ltd. and Vedanta Ltd. were among the top gainers on the index.